Adele is really and truly sorry to all of her fans, particularly the ones living in the Phoenix area. But, unfortunately, a nasty cold prevented her from performing her scheduled August 17 concert at Talking Stick Resort Arena. One might think that the vaunted desert climate would have cleared all that up, but no. Naturally, the concert will be rescheduled, and refunds will be made available to anyone who cannot attend the show on another date. It’s all quite upsetting. Reeling from the arbitrary unfairness of it all, Adele took to social media last Wednesday, posting a contrite, minute-long apology video to her Twitter account. 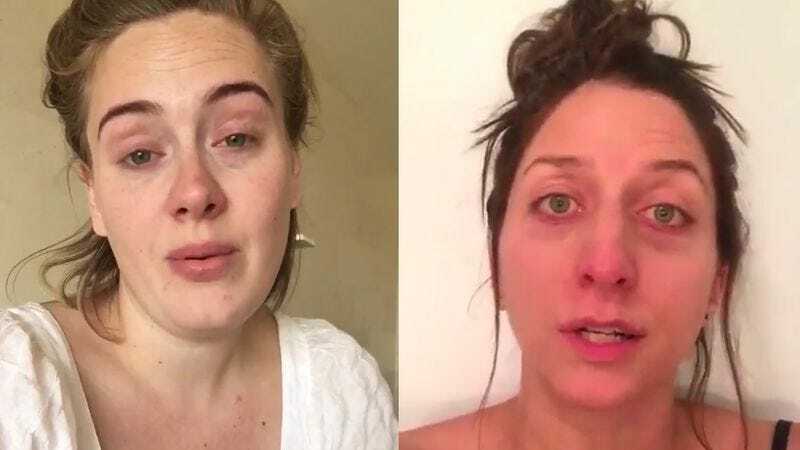 Here, Adele’s illness can be plainly seen in the pronounced redness of her nose and eyes, and her valuable voice is much raspier than usual, too. Sad as this message is, something about this video must have struck Chelsea Peretti as incredibly funny, however, since the comedian and Brooklyn Nine-Nine actress posted her own, pitch-perfect parody to Twitter in three installments. I’m really sick, and I’m so sorry, and I hate to cancel being on social media, but I’ve, like, pushed it in so many occasions where I shouldn’t be on social media, and now I’m paying for it. And I hate to cancel. I love my fans, and I’m going to make it up to you. I’m gonna be on social media most likely tomorrow or even later tonight if I get some energy. Like Adele, Peretti knows that even her incredibly temporary absence from public life is absolute torture for her fans. So she’s making sure that the absence is as brief as humanly possibly. It’s really the little, insignificant people out there who suffer in cases like this. Without their favorite celebrities to give their lives meaning, what are they to do with themselves? And Peretti wasn’t done milking this for comedy. She also posted a very funny little makeup tutorial video to Instagram, explaining how she achieved her look for the Adele video. Brooklyn Nine-Nine’s "Bachelor/ette Party" really is a "cray cray night of funky fun"